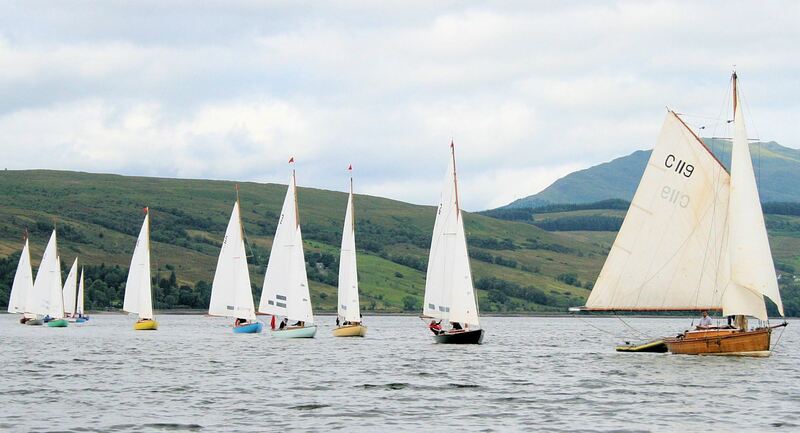 Camilla, 30 years their senior, leads the Gareloch One Designs during their 90th anniversary sail past, Gareloch, Scotland, August 2014. The sweet, varnished gaff cutter Camilla is one of a very special group of surviving yachts designed during the all too short lifetime of Glasgow naval architect and yacht designer, G.L. Watson (1851-1904). The business carrying his name continued – and still does – but pre-1904 vessels are extremely rare. During the last weekend of August, Camilla led the Gareloch One Design fleet – the “Gareloch Godesses” – across the Scottish loch they are named after, from the site of their birth at Clynder to the Royal Northern & Clyde Yacht Club, Rhu for their 90th anniversary salute. Camilla racing at the 1995 McGruer Regatta. Numbers ending in four are very significant in this story: the Club can trace the Royal Northern YC side of its ancestry back to its foundation in 1824 as the Northern Yacht Club on Belfast Lough ( now Northern) Ireland; Camilla was built by Alexander Robertson and launched at his Sandbank, Holy Loch yard in 1894; the 24ft Gareloch One Designs were designed by Ewing McGruer and built at Clynder by his family boatyard, McGruer & Co., from 1924; and Camilla’s designer died in his prime in 1904, in his 54th year. Camilla is typical of the smaller Clyde yachts of her time, owing their origins to a fusion of the local inshore fishing boats with the contemporary rapid advances in yacht design. She was commissioned by Samuel Millar of Glasgow about whom we know nothing more at present, except that he chose designer and builder very well. Arian and Bill Inglis, her present caretakers since 1986, are her 8th doting owners. The pitch pine on oak hull is in remarkable condition, but when they began necessary works to replace a soft deck and unoriginal deckhouse they were fortunate to make contact with an earlier owner whose input, together with the clues visible under the stripped deck, allowed her original pear-shaped coach house design and canvassed deck to be reinstated . Camilla is believed to be the oldest yacht, and the oldest locally designed and built yacht, regularly in commission on the Firth of Clyde – at least in the seasons when the 1887 William Fife Sr-designed Ayrshire Lass is not in commission. 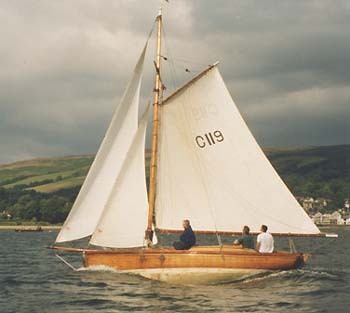 This entry was posted in boatbuilders, boatyards, Clyde yachting, Clydebuilt, Firth of Clyde, G.L. Watson, G.L. Watson & Co., G.L. 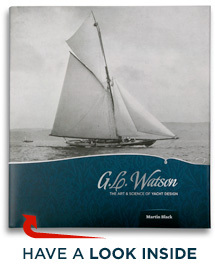 Watson clients, gift, Glasgow, naval architect, object of desire, other yacht designers, The Weekend Watson, Uncategorized, yacht clubs, yacht design, yacht designer, yacht racing, yachting history and tagged Ayrshire Lass, Belfast Lough, Beroe, Camilla, Clynder, Ewing McGruer, Gareloch, Gareloch One Design, Holy Loch, Kalizma, Madiz, McGruer, Minona, Peggy Bawn, Robertson of Sandbank, Royal Clyde YC, Royal Northern & Clyde YC, Royal Northern YC, Samuel Millar, Sandbank, Spartan, Triton, Volunteer. Bookmark the permalink.